For $30, you can’t beat the sound and comfort. As with all in-ears, you have something probing a facial orifice. As long as you’re cool with this, the Skullcandy buds are cool with probing you. Screw all the fancy stuff; Skullcandy made a great model with simple, straightforward technology. Ink’d delivers clean audio, passive noise reduction, and a full frequency range response. 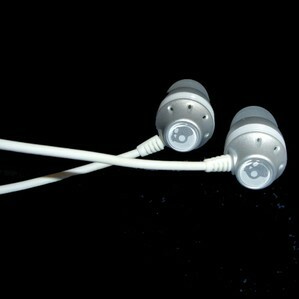 Screw all the fancy stuff; Skullcandy made a great model with simple, straightforward technology. Ink’d delivers clean audio, passive noise reduction, and a full frequency range response..
I’m usually apprehensive about using products with skulls all over its packaging. I feel as though it's indicative of bad things to come. Skullcandy has forever broken this negative image association for me. Their Ink’d Smokin’ Buds are a combination of great sound, natural noise reduction, and decent comfort. As far as earbuds go, the Ink’d rate high in comfort. Perhaps the best thing about them is they don’t try to incorporate any technology that simply doesn’t work within the design of small earbuds. The Ink’d use a well-sealed rubber surround that naturally isolates the inner ear from the outside world. They are light and small, and don’t create unnecessary pressure on the inner walls of my freakishly small ear canals. The Ink’d have a frequency range from 20Hz to 20kHz. They deliver these frequencies, no doubt about it. Obviously, they don’t have booming low end, but you can hear it all very well. However, as well as the sound is reproduced, the Ink’d have a hard edge. When new instruments come into the mix, they are often awkward, loud and disruptive. This is characteristic of in-ears, though. The sound has no atmosphere to meet and the timbres have no place to mingle before getting to your ear canal. So you’re observing the music out of its natural environment, and it'll behave like a different animal. If nothing else, put these in-ears through the Graceland test. Turn on the Graceland album, sit back and listen at half-level. If you smile, they pass. I’m smiling.